We’re entering week nine of the 2017 NFL season and the 49ers are bringing the action home. Yes, the next three games will be played right here at the Levi’s Stadium in Santa Clara, CA. You know what that means, San Francisco Bay Area — it’s time for you to show some local fan love and break out some red and gold! Maybe your support is just what the team needs to turn the tide! Will you be watching the upcoming 49ers home games? The team has undergone a lot of changes in recent years. Yet, they’re still hanging in there and the 49ers fan base in the Bay Area is still holding strong. 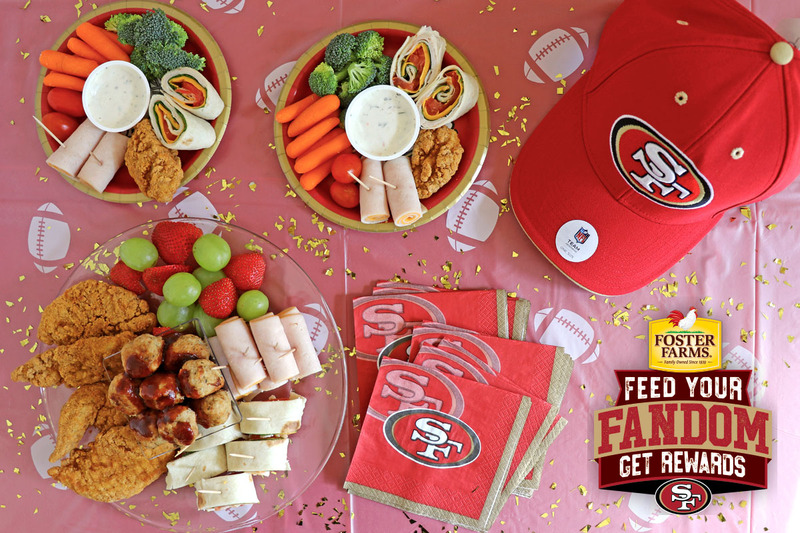 That’s why, as the official chicken and turkey of the San Francisco 49ers, Foster Farms is aiming to “Feed Your Fandom” this month. During this special promotion, 49 prizes will be awarded daily. These range from coupons for chicken or turkey products to merchandise to actual game tickets. All entries, both winning and non-winning, are eligible for a chance to win the Grand Prize — a VIP Suite Experience for 16 friends and family members to the December 17th 49ers home game. Plus, every entry helps feed the hungry! 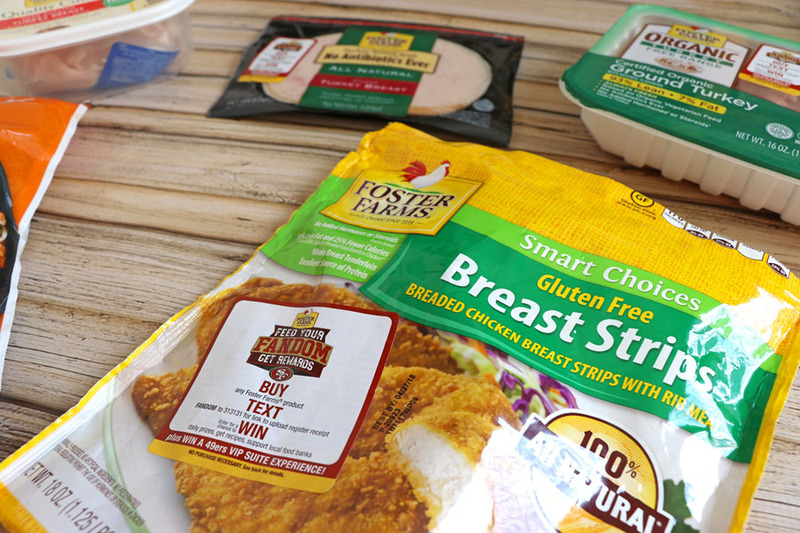 Foster Farms offers a HUGE variety of chicken and turkey products. So much so that it took me 1-1/2 hours at the store to figure out which ones I wanted to buy. I literally stood in the deli, frozen, and refrigerated meat sections and stared at the products like a deer in headlights. I was wrought with indecision because there were so many choices! The fact that I was only looking for gluten free items helped narrow it down a bit. But, even then, it took me at least 30 minutes to decide on 1-2 lunch meat selections! Items in the frozen aisle were equally challenging to choose from. Deciding what to get was the hardest part. Actually putting together a variety of gluten free Game Day snacks went pretty quickly. While the chicken strips heated, I put together some meat and cheese rolls and made wraps. The wraps consisted of gluten free tortillas, turkey, cheese, tomatoes, and spinach. Then, I compiled a mix of spices and added an egg, breadcrumbs, and ground turkey to make meatballs. Within a few minutes, those were done and smothered in BBQ sauce. My family was full with leftovers to spare. So easy and tasty! Now my family and I are fully prepared for any 49ers viewing parties that might arise. What about you? Given more time and (hopefully) better decision-making skills, I’m sure you can come up with a whole slew of amazing Game Day snack yummies! 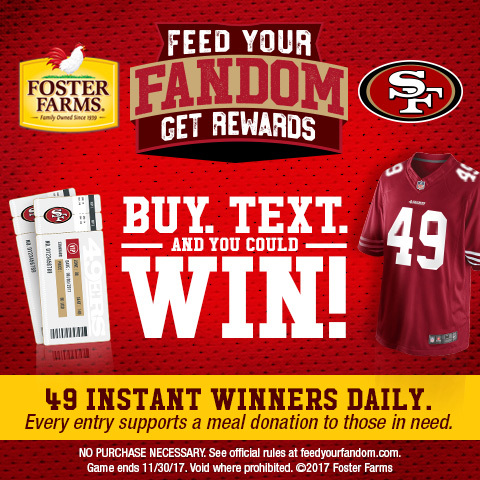 Just don’t forget to upload those Foster Farms chicken or turkey receipts at Feed Your Fandom for a chance to win one or more of the prizes. 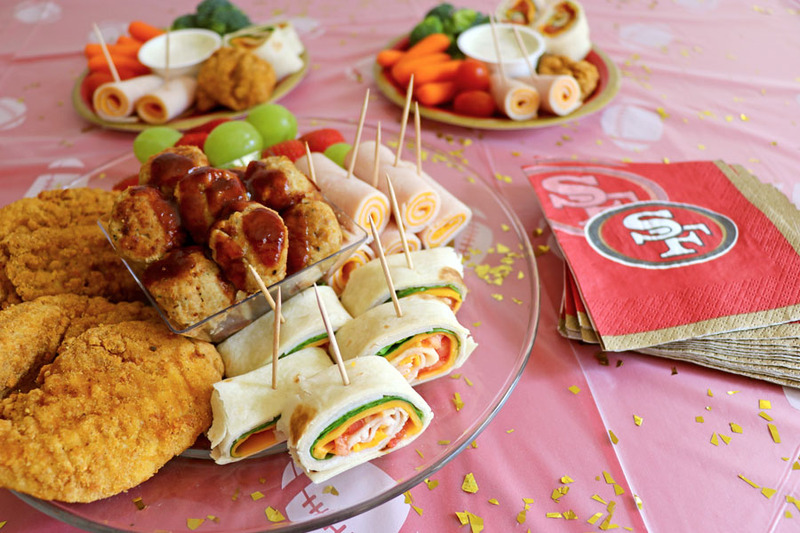 To help you cheer on the 49ers and get your Game Day preparations underway, Foster Farms is giving away $100 in Foster Farms coupons to one of my readers. One winner will receive 10 coupons valued at $9.99 value each and are good for any Foster Farms chicken or turkey varieties. Enter below! I was provided with product and compensated for this post. All opinions are my own. I like their buffalo wings on game days. My famous (or infamous 🙂 turkey chili! 🙂 Thank you. My favorite go-to “Game Day” snack is a Smoky Turkey & Caramelized Onion Quesadilla. We love making chicken wraps! We enjoy chicken wings for snacks. Honey BBQ Chicken wings are a favorite. My favorite go-to ‘Game Day’ snack is the Foster Farms Kettlecorn Chicken! Hot wings with ranch dip.. love them.,.. Honey garlic chicken tenders…is a must on game day. We make buffalo chicken sandwiches in the oven. I like making Sweet & Sour Meatballs using ground turkey. We love chicken wings or strips for game day!! Taco bar with chicken tacos – less prep for me & everyone gets what they want! Thanks! We love crispy chicken sliders. I like to serve Chicken Fingers. I would use the Foster Farm chicken strips to make my Chicken strips dipped in my honey, barbecue sauce. So deliciousj to dip this chicken in my sauce. My kids love it. I would love the foster farm chicken strips, thank you so much! We love either boneless chicken wings or chicken nachos. Same as regular, but with chicken. We like chicken nuggets dipped in our favorite sauces! One of our go-to favorites are Foster Farms Mini Corn Dogs! I love the chicken wings on game day Foster Farms of course. Buffalo chicken dip is my favorite! My girls like chicken wraps with sour cream and cheese. thank you! I like to serve a big plateful of chicken strips along with several small bowls of ketchup, salsa, ranch, cheese dip, etc. Great finger food. I make spicy chicken nuggets in a sweet hot dip ! I like finger foods that I can eat and watch the game, so any of their boneless varieties work best. I want to be able to eat without having to look at the food and away from the TV!!! I like making bacon wrapped chicken bites and turkey pinwheel sandwiches. We like chicken tenders with ranch dip. We love chicken quesadillas. Thanks for the chance. I like Foster Farms buffalo wings. Oh we love making chicken and cheese crescent roll-ups! My favorite Foster Farms go to “Game Day ” snack is their Buffalo Hot Wings. I go with the meatballs and my homemade dipping sauce. Our go to is definitely boneless wings and Onion Rings. Turkey wraps are so delicious! I love pinwheels, tortillas or flat bread layered with deli meat and cheeses and your favorite condiments, rolled up and sliced. Thanks for the chance to win. I make Buffalo Wings with dip for game day!! We love boneless chicken wings with blue cheese. Any of the chicken they have with some BBQ sauce for dipping. perfect! We always have to have subs on hand to go with the wings, vegis, dips and chips….yum! I use the chicken in my chicken nachos. Extra spicy wings, of course! BBQ wings does it for me and wouldn’t mind having some right now. I always BBQ some chicken for our games. Maybe a dip to go with it. My go to game day meal is mini chicken nugget sliders with cole slaw & tater tots. Turkey wraps are always a hit. We liked to make mini tacos with the grilled chicken strips. We like have them with mash potatoes and gravy and other sides. We love chicken fingers with honey mustard. We love the chicken strips with ranch, so good! I love making turkey bacon wrap pinwheels with cream cheese and grilled veggies yum! Buffalo chicken dip using shredded chicken. Yum! Our facorite game day snack is nachoes using Foster Farms. I like to make my own copycat recipe of Winger’s sticky fingers by using the crispy chicken strips or popcorn chicken and a delicious homemade sauce! I make a really good chili with ground turkey. The wraps look and sound so delicious! I am craving those now! 🙂 My girls just adore chicken nuggets. Thank you for the wonderful giveaway! I like their chicken wings and ranch sauce. We love the chicken wings. Id say chicken fingers with dip, chips and salsa. Buffalo Chicken wings are my all time favorite game day snack! We love their chicken nuggets with bbq sauce. Corn dogs would be a choice. I’d win this for my dad. He loves hot wings on game day. Wings and chips and dip on game day! My favorite is my buffalo chicken game day slider. I use a Foster Farms chicken strip, cook, and toss it in buffalo sauce. I tosat a slider bun and put the Buffalo chicken strip on it. I serve them with blue cheese and ranch dressing on the side. Buffalo chicken of course . I love shredded chicken nachos! I like making buffalo chicken dip! I love to do chicken tenders with blue cheese dip! One of my favorite game day snacks is the Tortilla Chicken Pizzas using Foster Farms Diced Chicken. We like their Foster Farms Meatballs served in a dipping sauce. I love turkey roll ups!!! Sliders and chicken strips are my go to. We love chicken tender subs. My mom makes this delicious cold taco salad that you eat with chips, love it! My favorite is chili with turkey! People love a good corn dog! I like to do boneless wings or chicken nachos/tacos. It’s always best to do things people can assemble themselves. i love having chicken fajitas for game day. they are easy and oh so good. Turkey sliders are always a big hit. Has to be chicken wings for us! Perfect for game day! I like the gluten free corn dogs. Buffalo wings are my favorite. Buffalo chicken wraps are my go-to!! We love taking chicken strips, cover them with cheese and bacon bits, then dipping them in ranch dressing. Horrible for you but they are so good! My favorite game day snack is chicken poppers with dipping sauce. I like to make huge sub sandwiches with both Foster Farms chicken and turkey. I cut them into small pieces – they’re a big hit! BBQ or parm wings are a must. We enjoy serving up some Honey BBQ Chicken wings when company comes. I like making chicken sliders and we also can’t have game day without wings! Wings in bbq sauce with ranch dip is our go to..
Buffalo chicken nachos are my go to! My favorite game day snacks are barbecue chicken wings. I like buffalo chicken wings. My favorite go to snack for game day is nachos. I love to make a spicy buffalo chicken dip that is amazing on game day! chicken casserole; it so quick to make and doent take long to cook! Buffalo Chicken Dip. I make it in small casseroles and hide one in the back of the frig for snacking the following day! Mine is definitely chicken wings. I like to make crock pot shredded chicken for sandwichses. Did you find this through online sweepstakes? I just checked and, for some reason, it listed the 17th as the ending but it actually ended yesterday. I tried to edit it but the site is not allowing it. I apologize for the confusion.